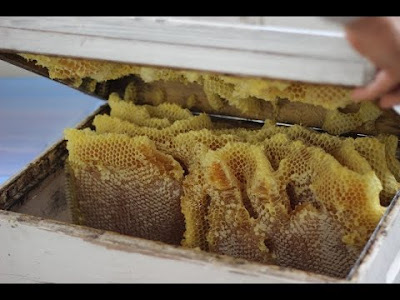 Biodynamic beekeeping is different from other beekeeping or bee-stewarding methods in that it aims to minimize environmental stress factors while allowing bees to develop in accordance with their true nature. - Natural combs are used, rather than foundation. - Swarming is recognized as the natural form of colony reproduction. - Clipping of queen’s wings is prohibited. - Regular and systematic queen replacement is prohibited. - Pollen substitutes are prohibited. - Beehives must be made of all natural materials, such as wood, straw, or clay. - Artificial insemination is not used. Instead queens are allowed to fly free to mate. - Grafting of larvae to produce queens is prohibited. - No pesticides or antibiotics are allowed, although the use of natural organic acids such as formic and oxalic acid may be used for mite control. - Honey may be transported in containers made of artificial materials but must be decanted into containers of glass or metal for retail sale. - Take surplus honey from the hive is allowed only in the spring after the bees use what they need.